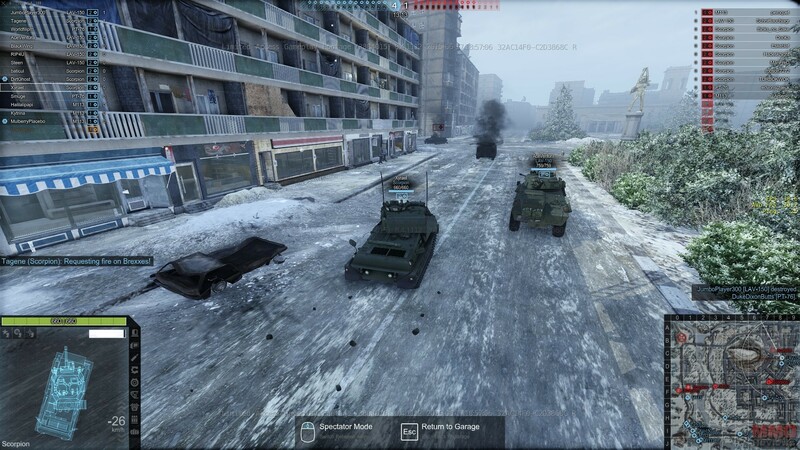 In armoured warfare players take control of a variety of different armoured vehicles and fight against and alongside each other across a multitude of battlefields in this tactical based free to play tank MMO. Where many modern tank strategy MMOs are focused more on World War II, armoured warfare puts a more modernised spin on the genre using more current and modern armoured vehicles and tanks. Players have control of their own machines of war and armoured vehicles, including typical all-purpose machines, long ranged artillery weapons and well armoured battle ready tanks. With a wide selection to choose from players will be able to select a vehicle that best suits their favoured play style when fighting on the battlefield. Progressing through the game players will meet a number of contacts, contractors and corporations that will be able to supply them with everything they need to build up their own personal Army. Using these relationships as players gain more experience they will unlock access to a larger selection of armoured vehicles, ammunition types and other items and resources useful in battle. Players are not only responsible for piloting their vehicles on the battlefield but also for maintaining them in the garage depot, ensuring they are fit for service and optimised with various upgrades and enhancements to give them the best chance of survival in battle. Learning how to drive and fight is one thing, but knowing how to best equip your vehicle to get the most out of it and switch up your payloads pre-battle depending on your objective is a completely different strategy that players must slowly learn to master. The best strategists know how to best utilise their terrain and environment, using woodland areas and natural cover to shield them from site as they flank an enemy or manoeuvring to the ridge of a hill to act as a long-range sniper for the team. Depending on the map endgame objectives players will have to quickly adapt to their environment, however, trying to take shelter in a building will only let you hold out for so long as much of the terrain and environment is destructible and it’ll only take a few well-placed shots to bring that building down around you. There are numerous game modes available to play including both competitive and cooperative games that require players to work as a team to either face skilled AI enemies or strategically superior teams of players. Whether working together to complete an objective players must work cooperatively and employ their tactical know-how on how to optimise their tanks pre-battle to fill necessary roles either for player versus player combat or scenario-based PVE. The developers have promised that regular content updates will be released to the community so that the game is always evolving and improving and the experience for new players and veterans alike is changing to keep things fresh and further adding to the replayability of the game. With new content updates players can expect to see new maps, game modes, tanks and extra weapons all of which will force players to constantly learn new tactics and strategy to be the best on the battlefield.